The Board of Regents today approved the appointment of Joyce Helens as the next president of Great Basin College, effective August 1. "Our search process has brought forward an excellent and experienced leader to take the helm of Great Basin College," said Rick Trachok, chair of the Board of Regents. "We look forward to the contributions she will make to the college and to the many students and communities it serves." Helens was one of three finalists who spent the past few days on campus participating in public forums and interviews. She was selected yesterday by the Board of Regents' ad hoc GBC President Search Committee with input from a 23-member community advisory group. "My husband and I are looking forward to building our home here," said Helens. "We feel comfortable with the area as it's an area we know and have visited before. I would say we are western people. It's a really good fit geographically for us." "I told President Curtis that I stand on his shoulders. I pay tribute and honor to what he has done at GBC, and now that allows us to get to the next level of excellence." She obtained a baccalaureate degree from St. Martin's University in Washington State and her Master's Degree from Portland State University where she also completed her doctoral coursework. Before coming to Minnesota, Helens was at the University of Alaska Statewide System, holding leadership positions at the University of Alaska Anchorage Community & Technical College and then as Executive Director of the University of Alaska Corporate Programs where she created a Corporate University within an academic university system to respond to the education and training needs of Alaska business and industry. 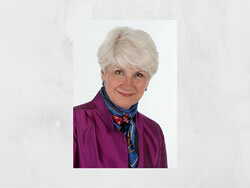 Helens also served in senior and executive community college leadership positions in Oregon, Texas and Washington.